Surely the presence of the Lord is in this place. I can feel His mighty power and His grace. I can hear the brush of angels wings. Trinity Church is a wonderful church community. We are old, young, diverse as to background in every way. And we are a strong and loving church community. As with congregants at all other Christian churches, the members of Trinity Episcopal Church are called to follow the Summary of the Law given by our Lord Jesus Christ. That means that we are to love the Lord our God with all our strength /and/ to love our neighbors as ourselves. We are to worship and to forge a genuine, welcoming and accepting community in the process. 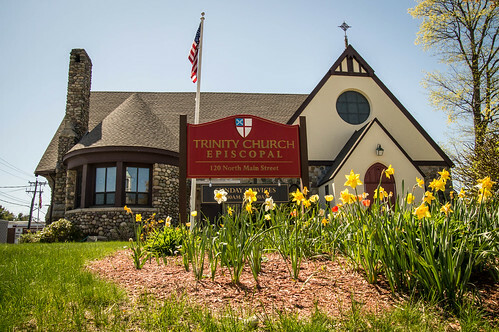 At Trinity Episcopal Church, we are always striving towards that end, and that means there is always a place for you in our midst. As we constantly invite new people into our fellowship, we are fulfilling our Lord’s Great Commission to the early Church: “Go therefore and make disciples of all nations, baptizing them in the name of the Father and of the Son and of the Holy Spirit.” (Matthew 28:19) We are a diverse group at Trinity. We are young families with children. We are retirees with children long grown. We are teenagers and singles. We come from a number of communities that surround Randolph. We come from a range of economic, social, racial and ethnic groups. We are life-long Episcopalians. We are Anglicans from other countries. We are former Roman Catholics and Protestants. We are people with little or no Church background. We are people who have been active in the Church all our lives. But there is one thing we all have in common: Somehow God has spoken to us in this place. We have found a home and we have experienced a genuine community here. And we are convinced there is a place here for you, as well. Come and see! Trinity Episcopal Church. Where Faith and Family Meet! Trinity Church Randolph is part of The Episcopal Diocese of Massachusetts. We are 180 congregations in eastern Massachusetts, Cape Cod and the islands. We seek to be Christ’s presence in the world as we answer God’s urgent call together. Join us!